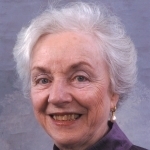 (HOST) Commentator and former Vermont Governor Madeleine Kunin has been thinking about the late Geraldine Ferraro and her legacy as a political pioneer. (KUNIN) My most vivid memory of Geraldine Ferraro, who died recently, is when we were on the stage together at Memorial Auditorium in Burlington at a Democratic rally. It was the fall of 1984. She was making a campaign stop in her race for Vice President, and I was running for Governor. The photo of the two of us, hands raised and clasped high in the air in a V-for-victory sign, still hangs on a wall in my house. After the speeches, the crowd gathered around us. One man with a little girl perched on his shoulders was eager to introduce his little daughter. "I want her to know what women can do," he said, as we both took turns hugging the child. We knew we were making history. The New York Times‘ headline for Gerry Ferraro’s obituary declared: "She ended the men’s club of national politics." Yes, she did; but what we did not know is that the club would issue few invitations to women candidates for the highest offices. It took 24 years before another woman, Sarah Palin, would be nominated by her party for the vice presidency. And we thought that a woman would certainly be elected President of the United States in our lifetimes. Ferraro’s resume was stronger than Palin’s. She had been an experienced three-term Congresswoman from Queens before she was selected by Walter Mondale to be his running-mate. Still, she was barraged by criticism about her qualifications. I remember a marathon two-hour press conference about her husband’s finances where she answered every tiny detail before a relentless paper-shuffling press corps. Her performance was considered a triumph, but the idea that she was culpable for her husband’s actions continued to stick despite the fact that no charges were ever brought against him. In one debate with George H.W. Bush, the incumbent Vice-President, he said words to the effect of "What does she know about throw weights? "- in a blatant attempt to show her lack of knowledge about military hardware and, therefore, unfit to be the understudy for Commander-in-Chief. I could not help but ask myself, would they have treated a man the same way? It’s a question I continued to ask when Hillary Clinton was running for the Democratic nomination for the Presidency. All that emphasis on hair, hemlines and husbands means that women have to lug that extra baggage from one campaign stop to another. Perhaps that’s one of the reasons that the percentage of women in the Congress continues to be so low – just 16 percent. Still, there is good news. The first women who broke barriers will make it easier for others. In states like Vermont, women are almost equal members of the club; they comprise 38 percent of the legislature. And that little girl who met Gerry Ferraro 24 years ago might imagine a great future for herself because she met a woman running for Vice President. Gerry, we’re sorry to lose you, but thank you for clearing the way.